Not to be confused with Sherman, Texas. 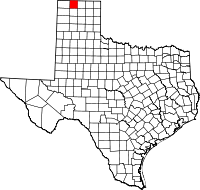 Sherman County is a county located in the U.S. state of Texas. As of the 2010 census, its population was 3,034. Its county seat is Stratford. The county was created in 1876 and organized in 1889. It is named for Sidney Sherman, who fought in the Texas Revolution. Though both Sherman County and Sherman, Texas, are named for the same person, the city of Sherman is located in Grayson County, approximately 430 miles to the southeast. According to the U.S. Census Bureau, the county has a total area of 923 square miles (2,390 km2), of which 923 square miles (2,390 km2) is land and 0.2 square miles (0.52 km2) (0.02%) is water. As of the census of 2000, there were 3,186 people, 1,124 households, and 865 families residing in the county. The population density was 4 people per square mile (1/km²). There were 1,275 housing units at an average density of 1 per square mile (1/km²). The racial makeup of the county was 82.49% White, 0.53% Black or African American, 0.66% Native American, 0.03% Asian, 14.63% from other races, and 1.66% from two or more races. 27.43% of the population were Hispanic or Latino of any race. In terms of ancestry, 20,3% were of German, 7,3% were of English, 7,1% were of American, 5,5% were of Irish, 2,6% were of Scottish, 1,9% were of Dutch. There were 1,124 households out of which 40.70% had children under the age of 18 living with them, 68.00% were married couples living together, 6.00% had a female householder with no husband present, and 23.00% were non-families. 21.50% of all households were made up of individuals and 10.00% had someone living alone who was 65 years of age or older. The average household size was 2.76 and the average family size was 3.24. In the county, the population was spread out with 31.40% under the age of 18, 7.00% from 18 to 24, 26.50% from 25 to 44, 21.50% from 45 to 64, and 13.60% who were 65 years of age or older. The median age was 34 years. For every 100 females there were 102.50 males. For every 100 females age 18 and over, there were 95.70 males. The median income for a household in the county was $33,179, and the median income for a family was $38,821. Males had a median income of $27,481 versus $21,036 for females. The per capita income for the county was $17,210. About 11.90% of families and 16.10% of the population were below the poverty line, including 21.90% of those under age 18 and 12.00% of those age 65 or over. Wikimedia Commons has media related to Sherman County, Texas. Sketch of Sidney Sherman from A pictorial history of Texas, from the earliest visits of European adventurers, to A.D. 1879, hosted by the Portal to Texas History.